Welcome to YA Books Central's "Indie Superstars" column. This event will spotlight the best and brightest of the indie community. This week we’re interviewing Kimberly Loth, author of "The Thorn Chronicles"
Michelle Lynn: Midnight Angel is more than a good vs. evil book. There are the shades in between and the people who've chosen one side when they really belong on the other. How did you come up with this concept? Kimberly Loth: Oh man, this takes me back. I think I've always felt that the battle between good and evil is the core of most stories. I love exploring it and the shades of gray. It's fascinating to me how people view good and evil. It's all based on your deep belief system. Naomi's dad for example, in his own twisted way he believed he was doing the right thing (I want to say more on that, but I can't without spoilers, haha). Michelle: Naomi is a fantastic character. She begins in a rather weak position but gets stronger as the book goes on. Tell us a bit about your thought process crafting her. Kimberly: The story all started with the first kiss between her and Kai. From that, I knew I needed a character who was oppressed in some way that wouldn't totally be freaked out by the kiss. I like kickass women in stories, which is why I loved Naomi's development so much. She had so much room to grow, but because her situation is so awful, she doesn't come across as whiny weak girl in the beginning. Michelle: The most interesting concept in this book is the cult. Did you have to do a lot of research into cults? Was there anything that inspired this? Kimberly: I always love this question. I did a lot of research. Most of it based on the cult in Kentucky that handles poisonous snakes. But the other thing is that while I was writing, there was an FBI raid near my home. I lived in the house that Naomi does. Middle of nowhere, but beautiful. It was a drug bust, but there were helicopters everywhere and lots of sirens. I didn't know at the time what it was, but in my head, it became the cult Naomi was trapped in. Michelle: Kai and Puck. Sigh. Those boys... I won't say which one I preferred over the other, but they each hold secrets and are definitely swoon-worthy. Want to give us some insight into the dynamic between them? Kimberly: Oh, gosh. I don't know what kind of insight you are looking for, haha. But I love them both. Michelle: There is a lot of mysoginism running through this world you've created. Naomi is sort of trying to break through it and I'm looking forward to her continuing to prove her place in all of it. Was it difficult writing such a world as a woman? Kimberly: Not really. I grew up in a matriarchal home and so I've always had strong women role models. I've also rarely felt the same discrimination and oppression that I think a lot of other women have. But I know a lot of women who have lived with fathers, husbands, or bosses like Naomi's (not as extreme, but the same attitudes) and I wanted to explore that. I also knew the ending and that Naomi would overcome it, and so it was safe to explore. Michelle: If you weren’t chosen to join the Confederation of Mages would you declare for the Mages exam? Kimberly: That depends on how confident I was in my magical ability. ;) If I felt, like Rocío does, that I was definitely skilled enough to handle the tests and that I'd been unfairly rejected, I probably would. If I could see that my abilities really were behind most other mages, I'd probably accept the judgment. Michelle: This book has a massive, twisty ending. Without giving it away, can you tell us in one word what you wanted the reader to feel when they got there? Michelle: You have quite a few books out. When did you start writing? Kimberly: I started writing in 2007. Midnight Angel was the second book I wrote, but the first one I published. Michelle: You're one of the more successful authors I've interviewed and I know you have a unique take on writing as a career. What is the number one thing you think an author needs to do in order to succeed? Kimberly: Just one? Haha. Drive. You have to want it and doggedly go after it. Michelle: When writing, do you ever break down emotionally over scenes you're working on? Kimberly: Oh yes. There are characters that I've killed off that I still miss. But I think you are probably talking about a couple of scenes in Midnight angel. I took a pretty clinical approach to those scenes. I had to take myself out Naomi's head and it made it easier. Michelle: How long do you typically take writing each book? She's been writing for ten years and is the author of the Amazon bestselling series The Dragon Kings. In her free time she volunteers at church, reads, and travels as often as possible. Because now, my father wants me to get married. The deadly cult that had kept me trapped for all these years just got a hundred times worse. I see no way out until one dark night when the impossible happens. That night, an angel sneaks into me room, kisses me and opens my eyes to a whole new, supernatural power. Using my newfound power, I fight back and discover that I’m not the only one with a secret…. 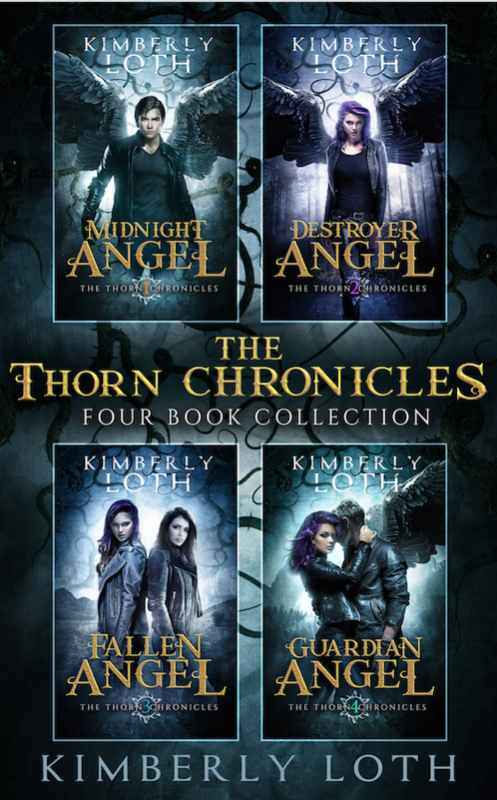 One winner will receive the complete series of The Thorn Chronicles in paperback (Midnight Angel, Destroyer Angel, Fallen Angel, and Guardian Angel). These covers for the series are totally amazing and I wanted to read them as soon as I saw it. I am into fantasy and adventure, and this caught my eye right away. Especially the synopsis. Classic good against evil, a truth uncovered, and a battle to fight for. I definitely want to read this. These covers for the series are totally amazing and I wanted to read them as soon as I saw it. ;) I am into fantasy and adventure, and this caught my eye right away. Especially the synopsis. Classic good against evil, a truth uncovered, and a battle to fight for. I definitely want to read this. Love the awesome covers & definitely want to read this series! Just fantastic!! The box set cover and the covers of each book are amazing! I love Kinberly Loth and cannot wait to read this series!! The covers are edgy and cool. The premise sounds really exciting. The covers are gorgeous and the synopsis has me wanting to read this series. Eye-catching covers! I’ll admit I’ve never heard of these but they sound like a series I would love!